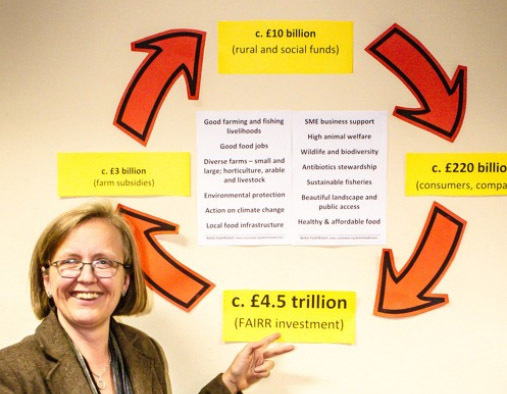 Sustain's chief executive Kath Dalmeny won the popular vote at a fringe event at the Conservative Party Conference in 2018, with her idea for investment of big money in sustainable, climate-friendly food and farming. Audience members chose Sustain's 'radical solution' as the one most likely to happen. The debate took place as part of Unlock Democracy's Radical Solutions series. Kath Dalmeny went on to feature as one of their podcast interviewees. Listen to the podcast here. Kath Dalmeny argued that there are critically important outcomes that we now expect from our food, farming and fishing. These range from solving obesity and climate change, to ensuring high animal welfare, good farming and fishing livelihoods, conservation of soil, water and pollinators, robust antibiotics stewardship, and much more. It is a huge shopping list, but nobody is stepping up to pay the bill. Such outcomes are generaly not rewarded by the market. c.£3 billion of farm payments, currently managed for UK farmers and land managers as part of the Common Agricultural Policy. c.£10 billion (probably more) of repatriated European funds - those currently distributed to UK regions and programmes, in the form of - for example - the European Social Fund, European Regional Development Fund, Leader+ and the European Maritime and Fisheries Fund. c.£220 billion in UK consumer spend on food and drink. c.£4.5 trillion, which which represents the investment funds influenced by the FAIRR initiative, seeking to shift finance decisions to divest from damaging practices and to invest in companies that support sustainable food, farming and environmental practices.